The BAW South Africa plant has been set up with a R196m cash injection from its local and South African partners. It will assemble minibus taxis. The opening of a new minibus assembly plant is expected to boost the development of the local taxi industry and at the same time create employment opportunities in the Ekurhuleni town of Springs, on Gauteng’s East Rand. BAW South Africa is the result of partnership formed by the Industrial Development Corporation, Beijing Automobile Industry Holding Company (BAIC), and China Africa Motors (CAM), the previous importer and distributor of BAW taxi vehicles into South Africa. About R196-million was injected into BAW South Africa, which will employ 469 people with more than 1 000 new jobs to be created by suppliers and dealers. BAIC, the fifth largest automotive manufacturer in China, holds 51 percent in BAW SA, with the IDC and CAM sharing the balance. The IDC contributed equity of R22,9-million and will also provide BAW SA with up to R98.6-million in debt facilities. The new plant will assemble taxis on a semi-knocked down basis, but with a final line identical to that of the completely knocked down (CKD) manufacturing plant. 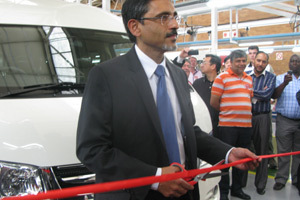 Speaking at the opening of the plant on Tuesday, 13 November in Ekurhuleni, Economic Development Minister Ebrahim Patel said the assembly plant was a step towards full localisation and manufacture of taxis in South Africa. About 22 000 vehicles a year are sold in South Africa’s taxi market; this is expected to grow to 28 000 vehicles by 2015. It also estimated that a further 100 000 vehicles are sold in the rest of Southern Africa. Phase 2 of the plant would require a R2-billion investment and could help create 1 500 additional jobs at the plant. 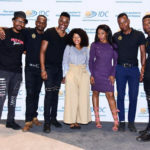 IDC’s chief risk officer, Gerrit van Wyk, said the investment underlined the continued strong co-operation between South Africa and the Brics countries. Brics groups the developing nations of Brazil, Russia, India, China and South Africa. “Localisation is essential to be able to compete globally. Competition is stiff in all markets and you want to be able to stand up against the rest,” said Van Wyk. The assembly plant is one of the first projects under the bus, truck and minibus programme initiated in 2010 to facilitate projects supporting the development of the local medium and heavy commercial vehicle industry in South Africa. He added that the group’s goal was to achieve annual sales of three million vehicles by 2015, which would rank it among the world’s top 10 international automotive groups.